Definition/Description: Echo reading is a rereading strategy designed to help students develop expressive, fluent reading as well as used for print knowledge. In echo reading, the teacher reads a short segment of text, sometimes a sentence or short paragraph, and the student echo it back. "Echo reading works best for short segments of text as particularly well-suited for beginning readers" (Jennings, Caldwell, and Lerner, 2014). Since the strategy can be used to develop both print knowledge as well as fluency there are different techniques within the strategy to be used to differentiate between the two literacy development areas. It is important that in this strategy that teacher make sure to use pointing when reading so students can gain the letter to print concept. Justification: "It shouldn't be a surprise to learn that students must hear fluent readers begin modeling if they are to understand how they should sound when they read fluently (Miller and Veatch, 2011). Since echo reading uses modeling as another form of assisted reading student are able to gain the support and guidance they need to understand print concepts as well as to develop fluent reading skills. Vygotsky theory about modeling and scaffolding for students for them to gain a better understanding on a topic or to develop their skills is spot on with this strategy, because the teacher models for students and then student join in with her/her before they are able to ever do the reading of the same text on their own. Also students are working with an educated adult working on fluency as well as others so they are gaining that social aspect part of his theory as well (Gunning, 2012). Also another part of this reading strategy that helps students is the point aspect. "Many children involved in finger pointed reading studies have reported that they use a system of counting words across the line of print help them identify specific words” (Jennings, Caldwell, and Lerner,2014). When students are following along by pointing they clearly see every word that they come across. "There's an emphasis that the strategy is much more complex than it appears to be. Research has shown that matching speech to print is an underlining skill of a specific word learning" (Jennings, Caldwell, and Lerner, 2014). These two statements and the research stated in our text clearly show the benefits of pointing during the echo reading strategy. This video gives steps as to how to implicate this strategy as well as gives an examples of a one-on-one echo reading. This would be a good video to share with parents, to demonstrate a strategy that will help their children develop reading skills. This video demonstrates how to use this strategy in a small group. Note how the teacher is using pointing as she reads and as the students do. This is because pointing helps students develop print concepts as well as helps them follow along and know where they are and what words are being read. ​Emergent readers- These students "need enriching and enjoyable experiences with books, especially picture books. 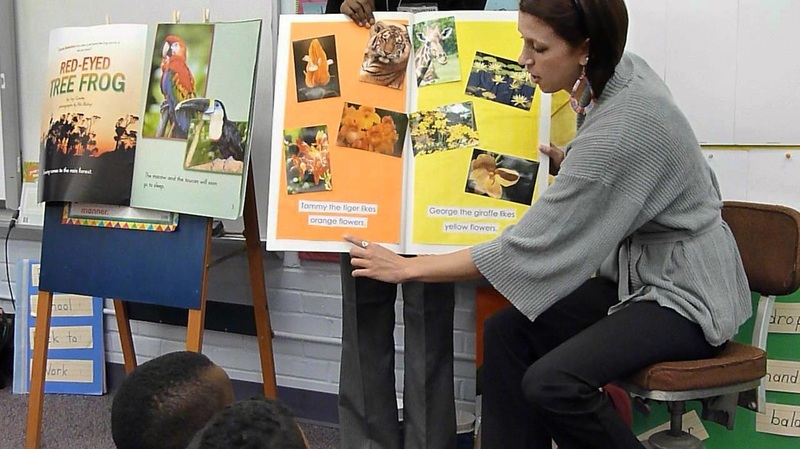 Sharing books over and over, extending stories, relating experiences to both print and pictures, and guiding students to "read," helps children begin to make predictions about what they are reading" (Reading Rockets. 2015). Since this strategy is rereading a book and uses picture cues it will help our emergent readers develop even strong skills in these areas of literacy development. Speech students- This strategy would help Student who have a speech impairment or disability, because they are fluently hearing the teacher read and are related the words to the vocal sound and pronunciation. Students with disability: For example a student with down syndrome this specific reading strategy would allow him/her to receive the collaboration in which many enjoy! Start with a few words before whole sentence for new or struggling readings. Use on one-on-one working times. Once students understand the concept have them do it in pairs, or small groups that are organize by teacher. Find leveled and appropriate books. Find books that will relate to the student, so he or she can connect their prior knowledge and background knowledge. Make sure to point out visual images and pictures on page, discuss why those help with understand the text. Teacher is modeling the effectiveness of pointing to each word when reading so student learn to develop print knowledge. Language Arts: Choose a book that is predicable and related to topic or content being taught Start lesson by activating prior knowledge and build background knowledge. Introduce the book to students and then start reading. First read the entire book modeling what a fluent reader would sound like and do. Then the teacher will continue to model fluency by reading of a short segment, usually one sentence. She will stop and have the students echo or repeat the same sentence. The class and teacher will keep doing this until it is done. At the end go over questions and what happen in book. Have student do an activity to show their comprehension of the book. Math: Teacher can read a story about a math concept using the shared book strategy and follow lesson up with the activity for examples. A teacher can read a book about adding numbers, go through the reading steps of this strategy and at the end he/she can have students do a math activity that is related to the content. Science: Teacher can read a story about a specif science content, such as world Photosynthesis or the life cycle. Teachers read the book and then go through the steps. The teacher can finish the lesson with a projects, graphic organizer, or activity sheet that goes along with the science concept and deepens the students understanding. Social Studies: Teacher can read a story about a specif social students content, such as world war 2 or The state of MN and go through the steps of this strategy. Teachers read the book and then go through the steps. The teacher can finish the lesson with a graphic organizer to compare the book or to build on background knowledge or skill. The picture above demonstrates the importance of tracking and pointing when reading. In this photo you can tell the student is using his figure to identify what the word says. He is using pointing to read or possibly sound out the words.